“Have you heard about the local fishing boat that went down in Seymour Narrows last Wednesday at 7 a.m.?” That was the information being passed on by the woman in the boat next to us as she helped us with our lines when we tied to the dock in Campbell River. And it was told again by two locals who came to chat with Rob while he put the boat up. Big news in Campbell River when the locals have trouble with the narrows. The crew came out alive, although the boat was trashed having been on it’s side and filled with seawater. Of course I couldn’t stand it and finally checked the tide tables to find exactly what I’d hoped to – the max current in Seymour Narrows that Wednesday morning was a 13 knott ebb at 8:00 am. We were carefully planning another transit at slack water and knew we’d be fine. But it’s still enough to make you be very careful and appreciate the need to time your travels. Tim and Cindy made it in on Sunday and took a few days of well deserved rest time. Rest time being, of course, time to work on the boat a bit. Rob & Tim got the new high output alternators installed on the engines, so we both now recharge in much shorter time than before. 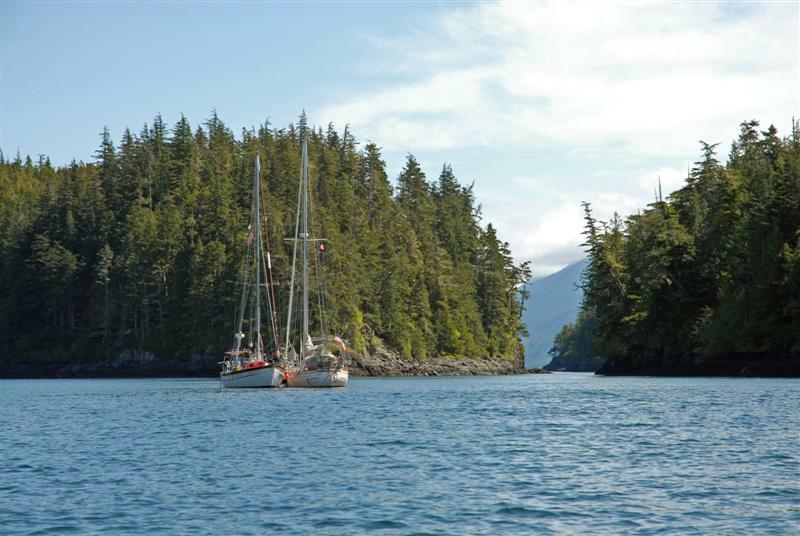 Wednesday we headed north through Seymour Narrows in calm waters at slack tide and into Johnstone Straits. The weather was so nice and the current so favorable we pushed on long past our planned stop. On Thursday the wind came up a bit, but was behind us, as was the current again. We stopped in a little island group called Pearce Islands at the bottom of the Broughton Archipeligo and spent Friday enjoying the sun and watching the population of enormous eagles around our anchorage. Friday night the Canadian weather folks forecast a low pressure system moving ashore, so we zipped over to Port McNeil yesterday morning and are sitting it out today. Tomorrow we’ll head for a little anchorage called God’s Pocket at the mouth of Queen Charlotte Strait to cross Queen Charlotte Sound and head north. This is a crossing we have to have a good weather window to make, and a high pressure system is forecast to build tomorrow, so it’s time to make a run for it.